Pain in the lumbar region of the back can be caused by any number of problems. 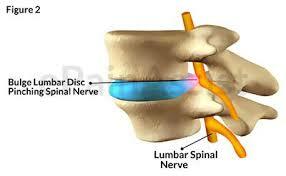 One common source of pain is due to compression of the lumbar discs. This compression can impinge muscles and nerves, causing pain. In order to relieve this pain, external means of lumbar disc decompression must be used. Lumbar disc decompression can be done in multiple ways. Typically, it is done in a surgical fashion. The method followed for lumbar disc decompression depends on the underlying cause of the lumbar pain. When the lumbar pain is caused due to spinal stenosis in the lumbar region, a laminectomy can be performed. This allows for more space for the root of the nerve. In spinal stenosis, there is a limited amount of space and lost there is compression of the nerve. This nervous compression causes pain and potentially weakness. Alternatively, lumbar pain can be caused by a herniated disc. In this case, a microdiscectomy can be completed. When a microdiscectomy is completed, part of the bone is removed. 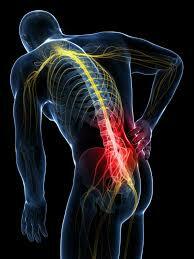 This allows for more space for the nerve and other contents of the spinal column to move. With a herniated disc, the herniation causes compression and pain. It is also common to see sciatic pain result from a herniated disc. As mentioned above, lumbar pain is commonly caused by compression. This compression can be due to a number of reasons. Whether it is secondary to swelling, skeletal problems, or muscular problems, the underlying issue presses against the nerve. When the nerve is pressed tightly, it is unable to operate the way it should. Frequently, this results in the nerve “short circuiting,” that is, creating a feedback loop. This feedback loop happens when the brain sends a motor signal to the nerve. The nerve should then relay the signal to the appropriate muscle. However, as it is unable to send the signal due to compression, it sends a signal to the brain expressing distress. This is typically interpreted as pain, but can also come across as weakness or tingling. Either way, the signal has been disrupted. In order to relieve this pain or tingling, the correct path for the signal must be restored. This can be done bye decompressing the spinal disc in question through the above-mentioned processes. When decompression has been completed, the pain should alleviate after time. Once pain has been relieved through the use of spinal decompression, it is of the utmost importance that further pain and compression is prohibited. This can be done through appropriate body mechanics in ergonomics, exercises, and stretching. When these techniques are not followed, further pain may develop. For example, a herniated disc may be caused by repetitive, poorly sequenced movements. This includes lifting improperly, twisting to quickly, or slouching. Whatever the underlying cause of the impairment originally, this should be avoided at all costs. Although lumbar disc decompression has been completed, that does not mean it can never again. Care must be exercised to ensure that the pain relief associated with lumbar disc decompression is maintained. Do you think that lumbar disc decompression may help you with pain relief? Schedule an appointment with Dr. Grimm to discuss whether or not it will help you.